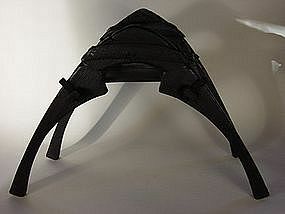 Waraji (straw sandal) Gata (mold). 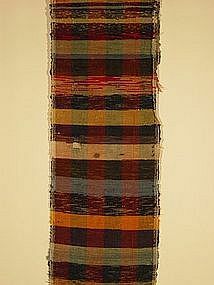 This mold was used to make the straw sandals worn by farmers. 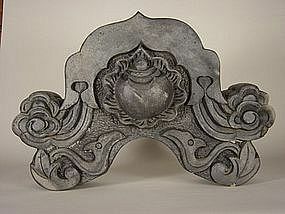 It is of solid carved wood. L. 50cm(19.75") x H.9cm(3.5") x W.9cm(3.5"). 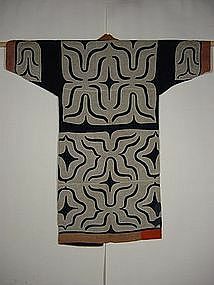 Acquired in Yamagata Prefecture in NE Japan (Tohoku), this piece exhibits the wonderful folk qualities of the region. 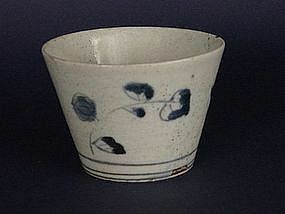 Hung vertically, the "shelf" portion of the mold can hold a small flower vase, creating a lovely "wabi" arrangement for the tokonoma. 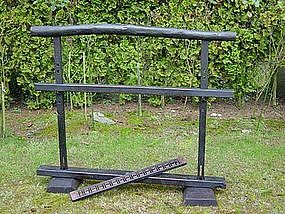 Large Itomaki, spool, for weaving. 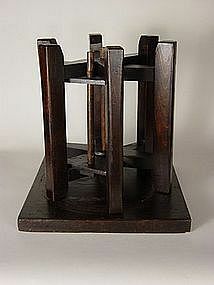 Wood with 6 arms. 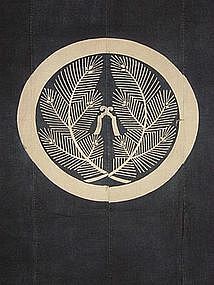 Late Meiji Era (1868-1912.) 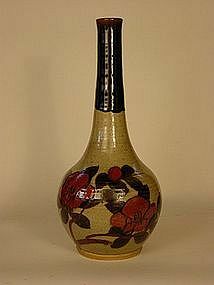 H.39cm(15.5") x Square Base of 37cm(14.5"). Good condition, has been cleaned and oiled. 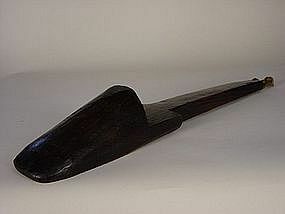 Wooden saddle, "kura" made of wood and iron fittings. 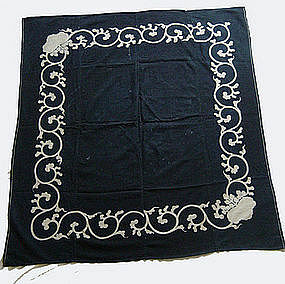 Meiji Era (1868-1912,) but the top board is a later addition. This flat board makes it ideal for display items, especially for flowers. H. 44cm(17.25") x W.68cm(26.75") x D. 32cm(12.5"). 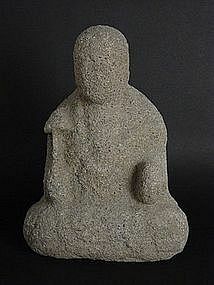 Jizo is one of the most beloved Buddhist Boddhisatva in Japan as a guardian of children and travellers. Sado Island in Niigata Prefecture was once ringed with Jizo statues, and its granite quarries made it a center of religious statue production and sales. This Jizo holds his hands in front of his chest in prayer, or in the traditional Indian greeting of "namaste." His face is well worn from the elements and time, but a faint smile seems to grace his lips. H.25cm(10") x W.13cm(5"). 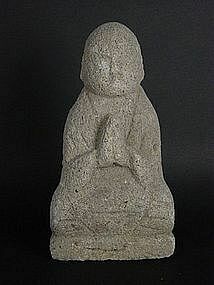 Jizo Statue, Carved Granite, late 19th C.
Jizo is of one of the most beloved of Buddhist Boddhisatvas in Japan as a guardian of children and travellers. Sado Island in Niigata Prefecture was once ringed with Jizo statues, and the granite there made it a center of religious sculpture production and sales. 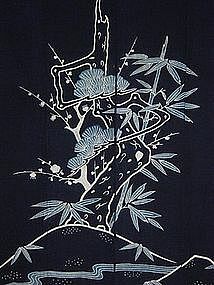 This Jizo hails from Sado and holds a lotus leaf in his right hand and a "tama" or Buddhist ball of wisdom in his left. His face is well worn from the elements and time. H.24cm(10") x W.17cm(6.75"). 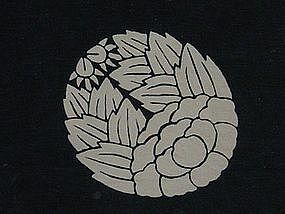 Onigawara, Roof Tile End Caps, of fired clay with motifs of Daikoku's Hammer and Tama, the Buddhist Jewel of Wisdom. H. 37cm(14.5") x W.56cm(22"0 x D.11cm(4.5"). Excellent condition from Meiji Era. 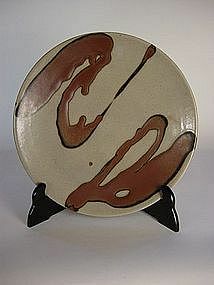 The region of Ogi in west-central Japan was a well-known center of roof tile prodcution, and continues this trade today. 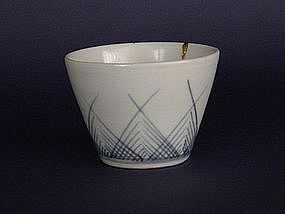 Imari ware bowls for serving small amounts of food were known as "kurowanka." 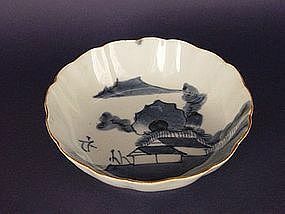 These bowls feature a "sansui" land & sea scape scene in underglaze cobalt blue on a porcelain body. Each piece is in god condition with individual measurements of H.4cm X Dia.15cm.